An offer letter is drafted or written in a formal manner. The Sample Letters play a significant role in making people understand regarding the way these letters are created in the open market. In these offer letters, individual templates, format, and other information and details have to be strictly followed without fail. A job offer acceptance letter needs to indicate that you are indeed an experienced professional. This particular offer letter also allows you to properly document certain key things regarding the job like your job title, more information about your job role along with the benefits. 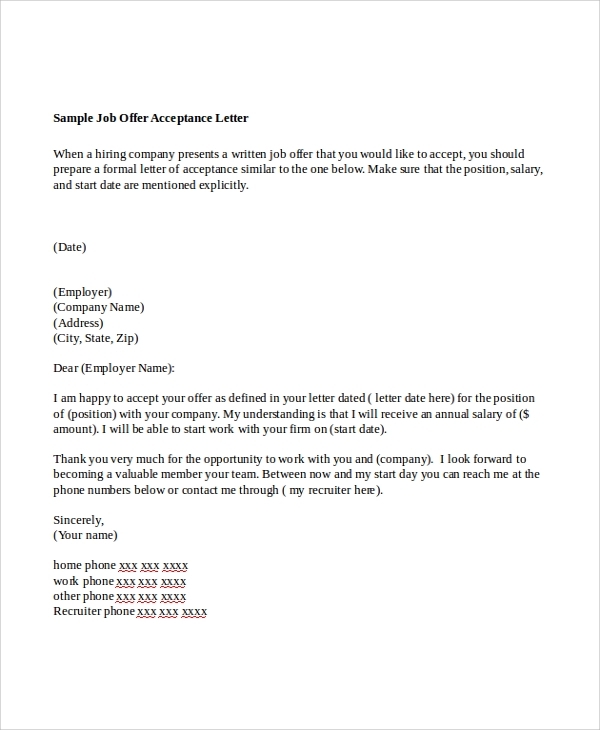 The employment offer letter samples come with a particular format, templates, other details and information exchanged between the employer and the employee in a meaningful manner. 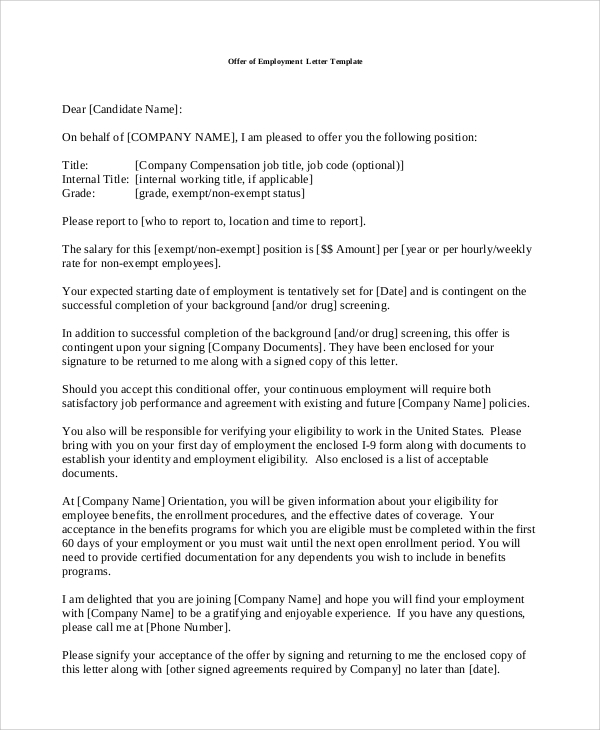 This offer letter plays a significant role in employment related activities. 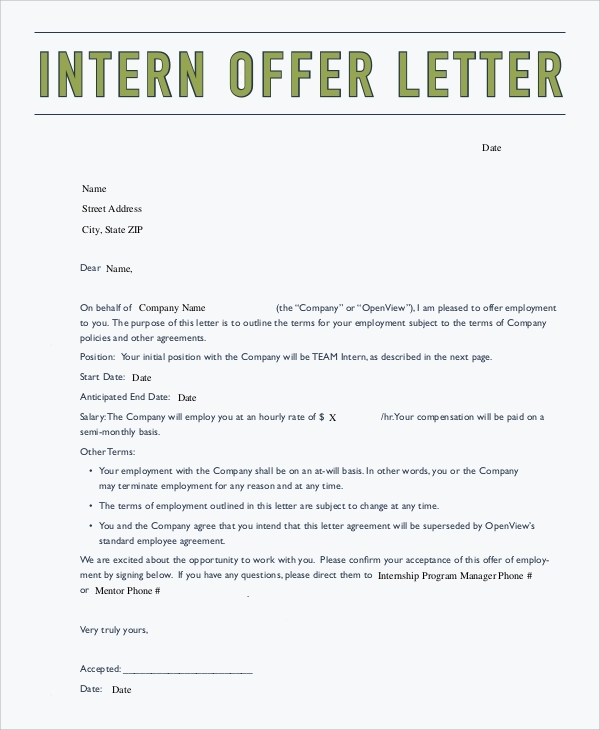 The above letter is an important offer letter written by the job aspirant to his or her employer in the open market. The drafting or writing of this offer letter should have kind or humble words. 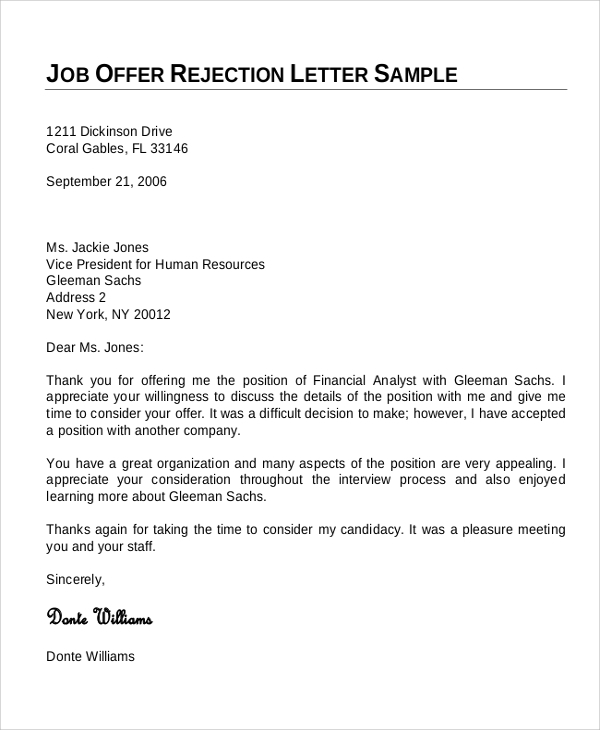 The Job offer rejection letter is written or drafted by the job aspirant to his or her employer who has selected the aspirant after certain rounds of interviews. 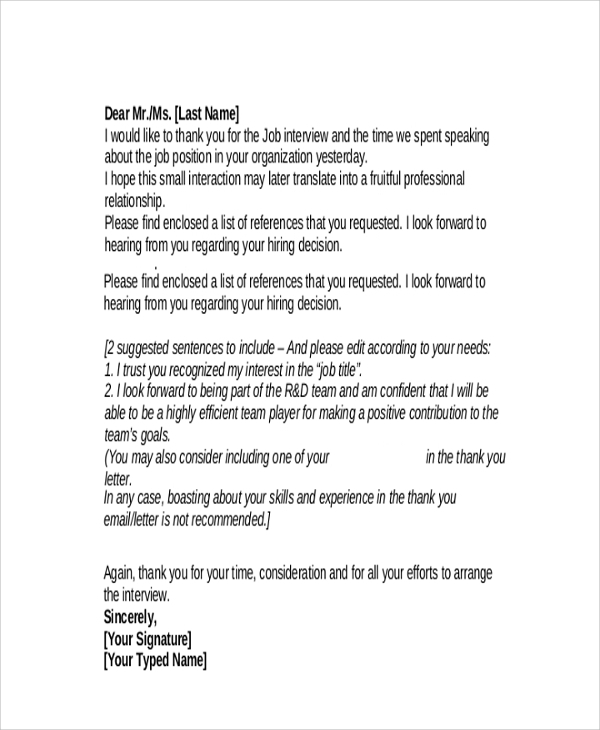 This offer letter should be able to explain the reasons for rejection in the right manner by the job aspirant. The sample offer letter comes with a fixed or customized format, templates and other details and information that are necessary to be communicated. This particular offer letter plays an important role among the job aspirants or employees and the employer. 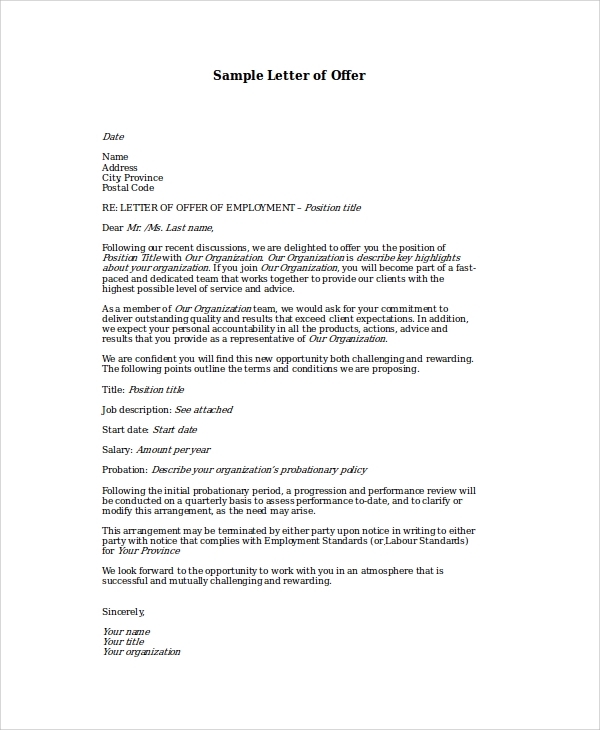 An employment offer Letter or an offer letter is a formal job offer letter that contains all the terms and conditions related to the job. It is usually provided in writing to a job aspirant who has been successfully selected to work with an organization or business. It is to be noted that the Job Offer Letter briefly describes details and information regarding the position offered, starting date, the location of the job, salary and other details and information about the job offered. 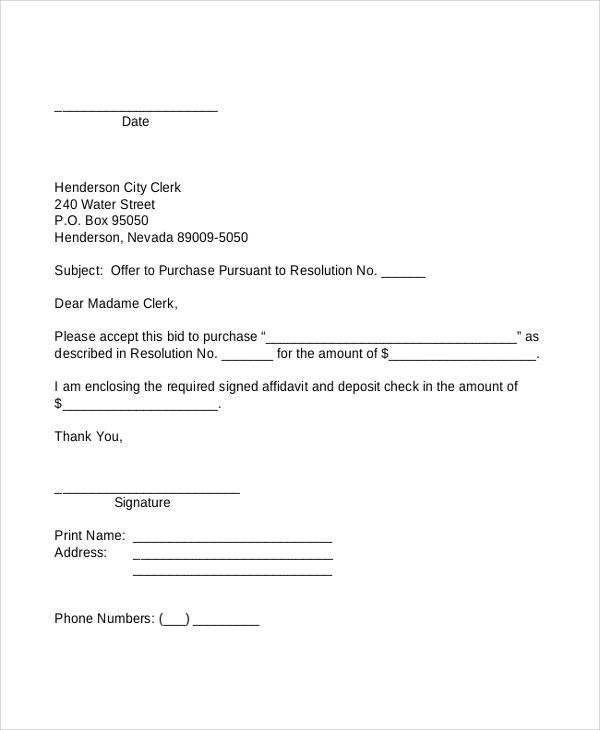 How To Create Or Draft An Offer Letter? You can personally ask regarding how to create or draft an offer letter with your family members, relatives, friends, and colleagues. They may help you regarding offer letter with their present and past professional experiences. You should be able to understand when they explain to you about the format, templates and other information and details shared by them in a complete manner. You must respect their knowledge and awareness regarding offer letters. You should get your queries answered and doubts cleared by them in a favorable manner. Sample Offer Acceptance Letters is a runaway hit among the users in the open market. Most of the offer letters are created or drafted in a professional manner. These offer letters go through the official channel of communication among the parties involved in it with a lot of perfection.